We display an enormous selection of beautiful framing and matting options in our showroom. Decorative and original art come in many shapes and sizes. We design custom framing for any item that you treasure or simply wish to hang on a wall. 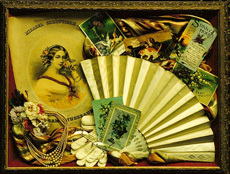 Our specialties include shadow and memory boxes, sports memorabilia, and textiles such as needlepoint or embroidery. 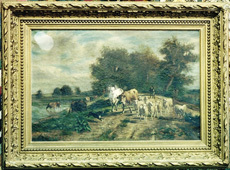 We are likewise skilled at conservation and museum quality framing for those original works of art or precious documents that require special care and handling. Please click here to view our work. The Hanging Place shows original art by a panel of gifted artists. Please click here to view a sampling of our current artists. Decorative art options are endless. Looking for a simple framed art print? We have an on online catalog in our showroom as well as print catalogs for you to view. A custom mirror is the perfect accent piece for your interiors. Over the fireplace, in the bathroom, in the foyer, a tray for your dressing table, we create mirrors for any space and in any size that you desire. 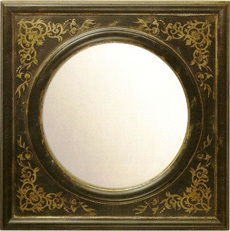 All of our frames can be made into a custom mirror. Looking for vintage? We have antique mirrors too! Please click here to view a sampling of custom mirrors. Shadow boxes are a wonderful way to preserve treasured mementoes or to commemorate a special event such as a wedding, graduation, retirement, commissioning, christening, etc. For any special item that you wish to frame when you aren’t sure how to do so, a shadowbox is an excellent choice. We individually handcraft each shadowbox and custom design it for beautiful display. Please click here to view our custom shadow boxes. 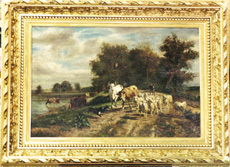 The Hanging Place restores works on paper or canvas to help regain the item’s original luster. Have an old or damaged frame? Plaster, gilding or wood replacement, we have the skills to breathe new life into that old frame. We restore timeworn and damaged photographs. 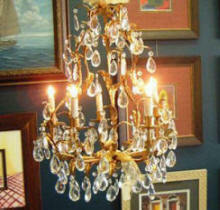 Antiques, vintage lighting, beautiful found and one-of-a-kind items adorn our showroom. We are available to assist in accessorizing or staging rooms in your home. Please contact us to set up an appointment. Can’t make it to our store? Email us an image of your artwork, print, photo, whatever you wish to display in a custom designed frame. Include exact dimensions, length and width, and depth so that we can determine frame and matting size. Also share your comments about where it will be displayed and design preferences, if any. We’ll review your image and suggest several options for framing as well as an estimate by return email. DISCLAIMER: Customers should come to our showroom to view the proposed final custom framing option. Alternatively, we can arrange to review custom framing options at your home or business. Color quality varies greatly on computer monitors and we recommend a final review in person to be certain that selections are appropriate to the item that we frame. 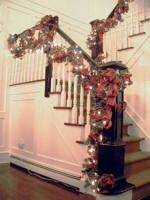 Holiday Décor: Custom Holiday décor for your home or business is one of our specialties in season. We design, create, install and are even able to store Holiday decorations for you.